Annuals are an interesting phenomenon in comics. They are not something which occurs at the same time every year, as the name would suggest, but are more a yearly thing done at the discretion of the publisher. In terms of what stories are told in these comics, it really can vary. The best annuals are typically those which either expand further upon things currently being told in the regular issues or the comic, or tell a stand alone story that is well-written and worth being told. Back during the 1960's The Amazing Spider-man's first annual featured the debut of the Sinister Six, a team of villains which had appeared throughout the comic's first 12 issues. When annuals are done well, their value in terms of time and money spent is immeasurable. When annuals are not done well, however, there is a big problem, and, sadly, this is a problem which has struck the pages of one of the best comics in The New 52: Batman. The second Batman annual of The New 52 sees the Dark Knight putting himself inside Arkham Asylum. Although this incarceration is not for any crime committed, instead Batman is being put in the super villain prison as a way of testing the new security measures. 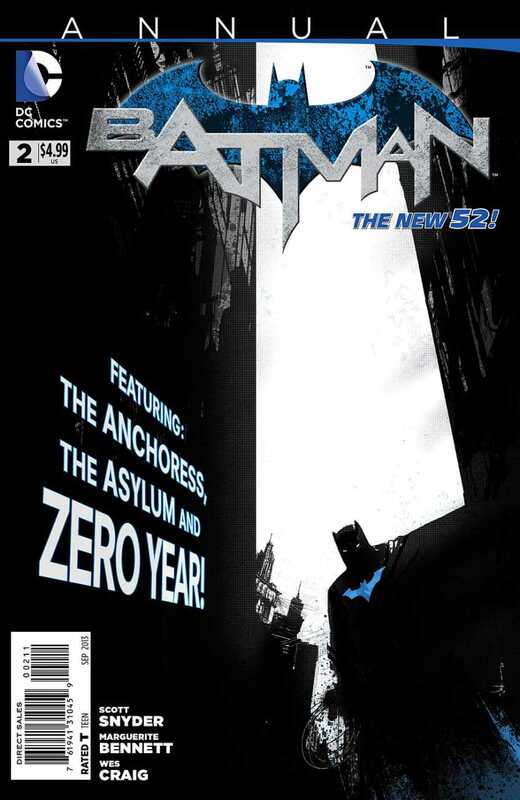 Meanwhile, it is the first day on the job for new Arkham orderly Eric Border and he has become interested in one patient in particular: Arkham's first patient the Anchoress, who has a revenge scheme planned against Batman that may spell the end of our hero. Let's start with the story of this annual as it may be the only thing about this entire thing which is somewhat good. It is perhaps worth noting that, although the cover may want you to believe differently, this issue was not written by Scott Snyder. Instead, this is an annual written by one of Snyder's creative writing students named Marguerite Bennett. Although Snyder is credited as helping with the story of this annual, almost everything is coming from Bennett. Arkham Asylum is not a new concept for Batman stories to explore by any means. Just about everyone who has tackled the Dark Knight in comics has attempted to do some sort of Arkham story, with the mental institution even becoming the focus of two successful video games. With that in mind, there was a danger going into this annual that Bennett would not have anything to say about Arkham Asylum that had not already been done by better writers, but having Batman testing the new security system at Arkham is actually a pretty clever idea. Batman knows his villains better than they know themselves, so it is only natural that the World's Greatest Detective could anticipate how they may attempt to escape from their cell. It is when Bennett explores these moments where the annual really feels worth the time and effort, but it is unfortunate that these moments are incredibly brief. Instead, this interesting idea is used as a method of shoehorning in a terribly uninteresting villain. If you were setting out to tell a story about Batman in Arkham Asylum, there are literally infinite directions in which you could go in terms of your antagonist. Batman may have the greatest rogue's gallery in all of comics, so whomever you chose could be a worthwhile story-telling venture. Bennett, however, makes the decision to focus the annual on the Anchoress, a new villain who was Arkham's first inmate. Unlike all of Batman's other foes, who are put in Arkham as a prison of sorts, the Anchoress actually sought out the asylum as a method of treatment. We are, of course, treated to the Anchoress' depressing origins, but they are frankly nothing which has not been done better with even other Batman villains. Anchoress is a bit of a bore as a villain. Fused with the ability to walk through walls, and, apparently, brains, Anchoress is played off as this huge threat to Batman's psyche. Frankly, it is a plot device which comes with very little stakes and without much meaning. We get to see the Anchoress' attempt to take over Batman's mind, showing the cliche scene of the murder of Bruce's parents, then the murder of his brother in the recent Court of Owls story, and then the murder of Damian Wayne. All of these images are meant to break Batman, to show him that he has failed as a hero, but it all comes off as feeling detached and unrealistic. If the Anchoress had been a long term villain, one we had had a plethora of issues to invest in with more fully-realized stakes, then maybe her attack on Batman would feel like something with more value. Instead, it more just comes off as Bats running into a crazy old woman while he is trying to do his job. Perhaps if Bennett had focused on Anchoress' belief that Arkham is no longer a place for treatment, it would have been more interesting, but these things are not expanded upon here. What we end up with is a forgettable villain and story as a result. Take a second to scroll back up and look at the cover of this annual. What catches your eye? Most likely it is the fact that, in a font about as large as the title, there are the words Zero Year. This annual has been primarily marketed and sold as a tie-in to the on-going origin story Scott Snyder is currently telling in Batman. DC and, possibly, Snyder want you to believe that, like the Mr. Freeze annual last year, this story will be something which is key to understanding the rest of the current story. When one actually opens the issue, however, they will find that Zero Year takes up all of 1 of the comic's 48 pages. If this reviewer's math is correct, that means Zero Year takes up approximately 2% of this supposed Zero Year tie-in. Now, the problem with this is not necessarily the false advertising, although that should certainly be enough to ruffle feathers. Unfortunately comics not capitalizing on the cover is something that happens all the time. What is the real problem with this is that it shows just how much of a missed opportunity this annual really was. We may only be two issues into Zero Year, but one cannot help but wonder if our time and money would have been better spent exploring either the Riddler or the Red Hood Gang, the primary antagonists of the Zero Year arc. Such a story-telling venture would have surely been more engaging than this tripe. As many faults as there are to be had with the writing of this Batman annual, it is the art where things really fall apart. Wes Craig is on art duties here, and, while one does not wish to call him a terrible artist (especially if the reviewer in question cannot draw), his work here is incredibly poor. Frankly, there are ads for Target which feature New 52 Batman that have better art than what we are treated to here. There are some aspects which look better than others, such as the time spent inside Bruce's head courtesy of the Anchoress, but that is really the only time throughout the issue where the art feels anywhere close to mediocre. Perhaps we are spoiled with Greg Capullo's art in Batman, but it is issues like these that make one grateful for what we have. Wes Craig may be better suited for other comics, but if he ever drew another Batman story it would be too soon. This may come as a shock, but there are many reasons that can make a reviewer feel too cruel when something is of poor quality. If one thinks for a second, you will realize that we are dealing here with a Batman story written by someone who is a first time Batman writer. No one started off perfect, and perhaps Marguerite Bennett will learn from this experience and one day return to the Caped Crusader with a better story. There are obviously some seeds of potential within this annual, but they are easily ignored in favor of the numerous faults. Ultimately it is the buyers who determine whether something is a success in this business, and, with this annual, your $5 is best spent elsewhere. Summary: Batman Annual #2 is a waste of time. There are some very small ideas in concept which are interesting, but all of that is drowned out by a forgettable story, an even more forgettable plot, and some of the worst art in Batman comics in over a decade.